This is a review of Nutrevita’s Advanced Hair Growth Formula. It claims to promote growth of natural, healthy hair. It further claims to improve the quality and density of your hair, in addition to aiding new growth in areas suffering from hair loss. The company also suggests that their Advanced Hair Growth Formula can have positive secondary effects on both your skin and nails, improving smoothness and strength. Read on to find out more about this supplement & find out if it’s the right product for you. Based on the company’s instructions, it is recommended that you take 3 pills daily, with food. It is not recommended to take this supplement within one hour of taking any medications, nor is it suggested that individuals exceed the recommended dosage. It is further recommended that any individuals with a history of peptic ulcers, or any condition associated with excess acidity (including heartburn) should stay clear of this supplement. Mothers (either pregnant with child, or nursing), as well as individuals under the age of 18 should consult with a physician before using this supplement. Upon critical review of the various amounts of vitamins, acids, and other included ingredients, it seems that Nutrevita’s Advanced Hair Growth Formula does indeed have high enough levels of the active ingredients (namely Biotin, Horsetail, and Thiamin) to have a noticeable impact on the human body. 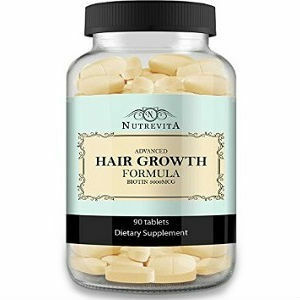 One bottle of Nutrevita’s Advanced Hair Growth Formula costs $44.99, and contains 90 pills, enough for 1 month’s supply. There are no discounts available through Nutrevita’s website, nor are there any sort of subscriptions available for additional savings. As the price is rather low, this product presents a much cheaper alternative for possible hair replacement than surgery, etc. Nutrevita advertises a full refund within 60 days of receiving your supplement. It should, however, be noted that there were no links or contact information to be found where an individual could hope to contact Nutrevita and gain said refund. No customer reviews could be located on the company’s site, but secondary seller sites contained mostly positive reviews. Nutrevita’s Advanced Hair Growth Supplement seems to be a solid product. The supplement is produced in a facility with GMP certification. It has large enough amounts of the active ingredients to have the desired effects of both improving your existing hair and creating new hair growth. Customer reviews were mostly positive, and emphasized the effects that Nutrevita promotes in their advertisements. Individuals should, however, be aware of the difficulty presented in pursuing the company’s refund guarantee. This suggests that this may not be a product for everyone. John Brownstone	reviewed Nutrevita Advanced Hair Growth Formula	on June 28th	 and gave it a rating of 3.5.